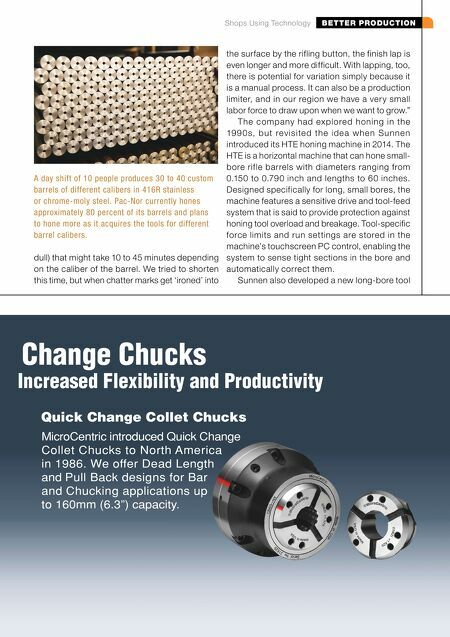 BETTER PRODUCTION Shops Using Technology Quick Change Collet Chucks MicroCentric introduced Quick Change Collet Chucks to North America in 1986. We offer Dead Length and Pull Back designs for Bar and Chucking applications up to 160mm (6.3") capacity. Increased Flexibility and Productivity Change Chucks dull) that might take 10 to 45 minutes depending on the caliber of the barrel. We tried to shorten this time, but when chatter marks get 'ironed' into the surface by the rifling button, the finish lap is even longer and more difficult. With lapping, too, there is potential for variation simply because it is a manual process. It can also be a production limiter, and in our region we have a ver y small labor force to draw upon when we want to grow." T he company had explored honing in the 19 9 0 s, b u t rev i s i te d th e i d e a w h e n S u n n e n introduced its HTE honing machine in 2014. The HTE is a horizontal machine that can hone small- bore rifle barrels with diameters ranging from 0.150 to 0.790 inch and lengths to 60 inches. Designed specifically for long, small bores, the machine features a sensitive drive and tool-feed system that is said to provide protection against honing tool overload and breakage. Tool-specific force limits and run settings are stored in the machine's touchscreen PC control, enabling the system to sense tight sections in the bore and automatically correct them. 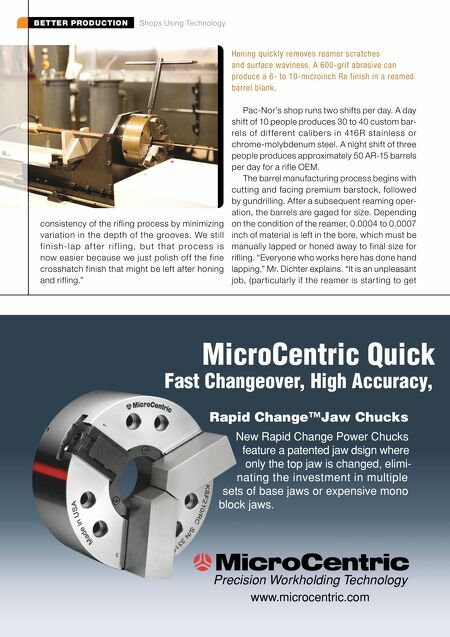 Sunnen also developed a new long-bore tool A day shift of 10 people produces 30 to 40 custom barrels of different calibers in 416R stainless or chrome-moly steel. Pac-Nor currently hones approximately 80 percent of its barrels and plans to hone more as it acquires the tools for different barrel calibers.